Ripe For Revival – 1934 Edition | THAT'S ENTERTAINMENT! Welcome to the start of a new week on THAT’S ENTERTAINMENT! Today we’re continuing our 15-week series on forgotten musicals that are ripe for reviving! Each Monday, we’ll be covering a different show from the years in between two landmarks – Show Boat (1927) and Oklahoma! 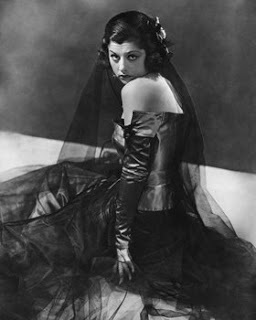 (1943). This period, the years immediately preceding the “Golden Age”, encompasses the entirety of the Great Depression, and represents an oft maligned period of the American musical’s history. Many of the shows from this era are considered unworthy of reviving because, despite electrifying scores by some of the best composers Broadway has ever known, their comparatively trivial books could only be carried by the unique and dynamic stars of the era. But such thinking only deprives theatre goers of the musical thrills that once helped make Broadway the landmark that it is today. The musicals that I’ll be covering over these next 15 weeks deserve re-examination. They deserve to be seen again. These shows are worth it. So far we have covered Whoopee! (1928), Sweet Adeline (1929), The New Yorkers (1930), The Band Wagon (1931), Face The Music (1932), and As Thousands Cheer (1933). Today’s featured musical is from 1934. The best musical of the year, and arguably the only ’30s musical to have a continued appeal among young theatre fans, is Anything Goes. With a fabulous score (the one that hooked me on Porter, Merman, and classic musicals in general), Anything Goes has been performed to death… most recently in a successful but miscast 2011 Broadway revival. (I’ll save my Foster bashing for a later post.) So, that show is in NO way “ripe for revival.” However, aside from Anything Goes, 1934 wasn’t really a great year for musical comedy. There were a couple of enjoyable revues — The Ziegfeld Follies of 1934 and Life Beings At 8:40 — but they aren’t of the caliber of The Band Wagon (1931) or As Thousands Cheer (1934), so I decided to go with a book musical for today’s post. Unfortunately, that didn’t leave me much to choose from. I’m not going to lie — the show I have selected would probably have little chance at success on Broadway today. Rather, I’m including this piece here because it’s ripe for rediscovery, filled with singable songs, and maybe worthy of a concert production or two. 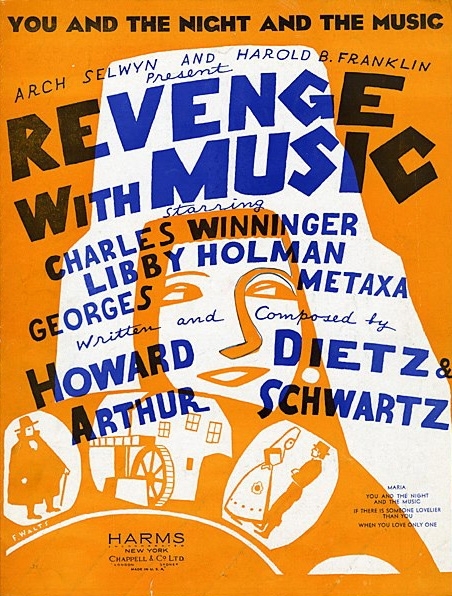 Revenge With Music was the first book musical written by the dynamic team of Arthur Schwartz, who supplied the music, and Howard Dietz, who wrote both the lyrics and the book. Based on a novel that was also adapted as an opera and a ballet, Revenge With Music told the fiery story of the Spanish Carlos (Georges Metaxa), who mistakingly believes that his new bride Maria (Libby Holman) has succumbed to the advances of a sleazy Gobernador (Charles Winninger). In retaliation, Carlos successfully seduces the Gobernador’s wife (Ilka Chase). Along the way, they sing and dance to a few finely crafted numbers on a revolving set of exotic Spanish locales. There are some incredibly gorgeous Schwartz-Dietz songs. Holman got a couple of excellent numbers in “When You Love Only One” and “Wand’ring Heart,” both of which should be examined by singers looking for torchy and melodic pieces to add to their repertoires. However, the two songs that later gained the most recognition were given to our hero, Metaxa. 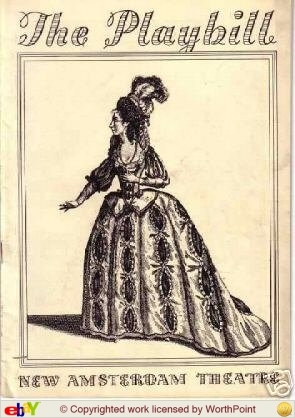 The first, “If There Is Someone Lovelier Than You,” he sang in Act One to Holman, his bride-to-be, and in Act Two while seducing the Gobernador’s wife. It’s such a genuine number that reprising it in Act Two removes any chance of trivializing the adultery, rendering the drama even more heightened than before. Brilliant song and brilliant usage of the song. The other number was for Metaxa and Holman at the end of the first act, “You And The Night And The Music,” a brilliant sweeping piece that reminds me a lot of “Soft Light And Sweet Music” (from Face The Music) in tone. They were the only two numbers from this score to see any popular success. But the piece has never been performed since 1935 (save a TV adaptation in the early ’50s) and it’s certainly not the score that holds it back. Once again, we must look to the book. With a plot lacking originality and a book offering little humor, I think Revenge With Music would be a difficult show for modern audiences to enjoy. There’s no draw — few laughs, scant star potential, and an unfamiliar score. However, this show should NOT be neglected. If the plot is rather pedestrian, we should at least note that Dietz handles the book with a flair that leans closer to operetta than musical comedy. Schwartz’s music follows suit with a score that seems more Kern than Porter. 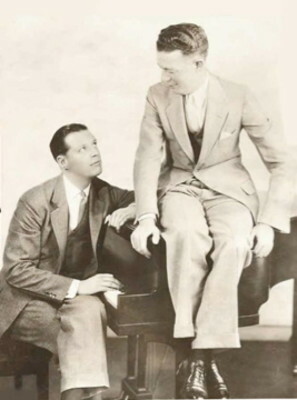 Because Dietz did double duty, the score was written around the book, meaning that numbers are more integrated into the story than ever before. Indeed, one of the songs is even titled after Holman’s character, “Maria.” Even historian Ethan Mordden asserts that beginning with Revenge With Music, musical comedy scores slowly became closer to their books, labeling this show as the missing link between Show Boat (1927) and Oklahoma! (1943). Even if that is an overstatement, we can at least appreciate the score’s strict adherence to its romantic Spanish plot, and the book’s resolve to include things that only served a purpose to the story. It’s a mature piece of theatre. But with less weight than Show Boat and less fun than Anything Goes, it’s a show that will probably never be prime for a major revival. Rather, it’s ideal for smaller companies like Musicals Tonight! looking for rare pieces to put on. The score is too beautiful to sit idle forever, and the strength of the book’s fluidity should be displayed for all those who maintain Oklahoma! was the FIRST integrated show. Revenge With Music might not be suited for today’s audiences, but it’s excellent for interested folks like you and me — it’s musically rich and historically fascinating. I hope we all get to see it someday in some form. Come back next Monday for a 1935 show that’s Ripe For Revival! And tune in tomorrow for the best Our Miss Brooks episodes from Season Four! Pingback: Schwartz In The ’30s: A Birthday Tribute | THAT'S ENTERTAINMENT!